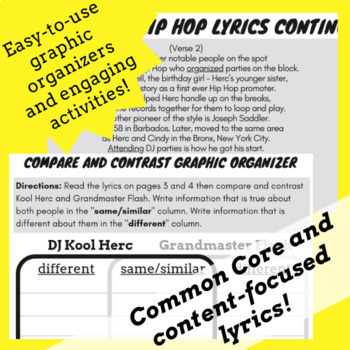 Keep students engaged using rap music and Hip Hop history themed, reading comprehension activities! 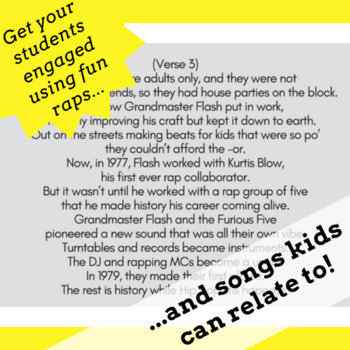 This history of Hip Hop music lesson has worksheets, a reading passage, and activities based on our history of Hip Hop music song. 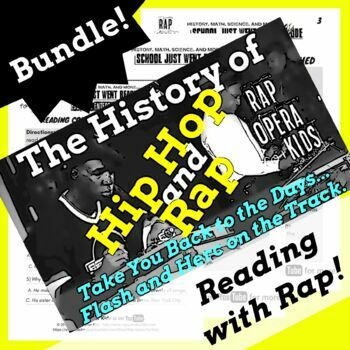 The reading passage, activities, and worksheets in this bundle utilize the Hip Hop history song, exploring how two founding fathers and a mother of Hip Hop contributed to the urban art, and how it developed into a unified sound. This bundle is an excellent mini curriculum to use with students who are fans of Hip Hop and rap music! Listen to the song with subtitles on YouTube! Kids love music and will certainly enjoy learning about the history of Hip Hop music while practicing important reading skills such as identifying the main idea and supporting details and using context clues with this rap song. All of these reading activities are based on the song lyrics, giving students a real and direct connection with the song. 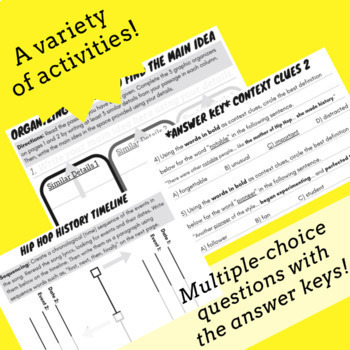 A variety of reading activities with the answer keys! The activities in this bundle feature everything listed below. Click the links above for more details. - a "Main Idea on Beast Mode!" challenge activity where students will identify the main idea of the entire song using their main idea and supporting details graphic organize. You can also get the individual, sequencing and timeline activities listed above here! This bundle also includes a bonus activity! Read more about it here. *Note: the reading comprehension questions, timeline, sequential paragraph, and context clues activities listed in this bundle are included in the compare and contrast activities product listed above in the links. Read the activity's description here for more details.